NEW YORK – July 11, 2017 – Informa Pharma Intelligence, the leading healthcare and pharmaceutical data and analysis firm, today released its “Snapshot of the Opioid Market.” The report and infographic chart the opioid industry’s journey into an $18.4B annual market1 in the US by 2020 and its attempts to combat the ongoing national crisis around opioid abuse. “At the same time the opioid market is expanding, deaths from opioid abuse are growing. 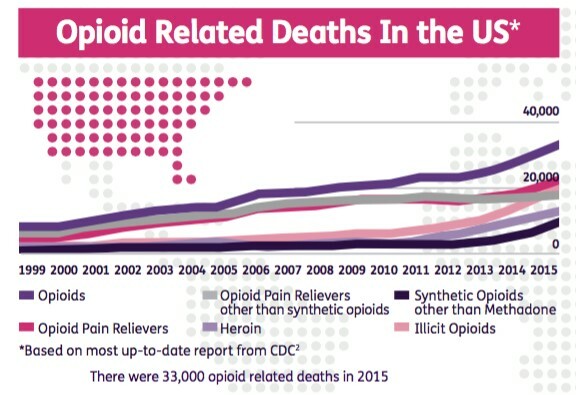 The CDC estimates that more than 33,000 people died from opioid related causes in the US in 2015 alone. It’s been a fascinating development to see how the FDA and the pharmaceutical industry have reacted to a crisis it unfortunately had a hand in creating.” said Michael Hay, Head of Intelligence Products for Informa Pharma. “Pushing for more ADF drugs has been a critical step towards curbing opioid abuse, while making sure the millions of people in need of pain medication have adequate access to the relief they need. However, how much this impacts the growing crisis remains to be seen as pharmaceutical companies pour more money into clinical trials and new finely tuned formulas over the next few years,” Hay, commented. If you’d like access to the full report from Informa Pharma or additional information on the growth of ADF opioid offerings, please reach out to InformaPharma@Diffusionpr.com. Informa Pharma Intelligence powers a full suite of analysis products - Datamonitor Healthcare, Sitetrove, Trialtrove, Pharmaprojects, Medtrack, Biomedtracker, Scrip, Pink Sheet and In Vivo – to deliver the data needed by the pharmaceutical and biomedical industry to make decisions and create real-world opportunities for growth. With more than 500 analysts keeping their fingers on the pulse of the industry, no key disease, clinical trial, drug approval or R&D project isn’t covered through the breadth and depth of data available to customers. Informa Pharma Intelligence, is part of the wider Informa Business Intelligence brand that provides insight into six core industries - Pharma & Healthcare; Agribusiness & Commodities; Finance; Telecoms, Media & Technology; Maritime & Law; Infrastructure. For more information visit pharmaintelligence.informa.com.